Ocean Acidification (OA) has long been accepted as an equally troublesome companion of Global Warming. Studies have not only exposed impending problems, but have given scientists an insight into the complexities behind achieving a comprehensive understanding of the overall bionetwork response to this worldwide problem. However, are investigators equipped well enough to deliver precise robust data critically needed for global ocean-atmospheric models, allowing attribution of changes to both anthropogenic and natural causes? This article discusses the considerations which need to be made while studying the impacts of OA, on both an ecological and technological level. Since the Industrial Revolution, the mean ocean surface acidity is estimated to have increased by 25-30% (1, 2), equivalent to a drop of 0.1pH, roughly 100 times faster than any change in acidity known within the last 20 million years. Predictions suggest an increase by a further 150-200%, representing an additional drop of 0.3pH, by the end of this century (2, 3, 4). Global unease as to the consequences of altering this ancient balance has seen OA become one of the fastest growing areas of research in marine sciences over the last few decades. In 2011, Andersson & Mackenzie (5) documented a Google internet search for OA as generating around 605,000 results; a replica search this week generated just under 3.2 million, demonstrating the dramatic surge of international interest from both the Public, Government and Scientific communities. Although the specific effects of warming, acidification and changes in circulation will vary across ocean basins, it is clear that there will be multiple impacts on ocean and coastal ecosystems throughout the world(6). For aquatic ecosystems, the consequences of long-term exposure to rising carbon dioxide (CO2) concentrations are still poorly understood (7) and while the detection of direct effects (physiological) is readily achievable, it will not necessarily shed light on the principal drivers which will be key in shaping future communities (8). Effects on individual species are likely to cascade throughout the entire ecosystem, influencing species interactions, food web dynamics, migration patterns and the overall bionetworks resiliency (6). The complications in studying ecosystem-level impacts, include yielding not only “unexpected results” but also some of the strongest ecological responses (i.e. phase-shifts) which are often unanticipated as the impact of one component (e.g. OA) on another (e.g. kelp decline), requires knowledge of a third species (e.g. kelp-competitors) or mediating factors (e.g. interactions among stressors) (8). The real problem therefore, is understanding the combined effects of additional stressors (i.e. global warming effects) which happen in line with rising acidity. Laboratory experiments can offer insight into how synergistic effects of added stressors determines alterations of marine communities in high CO2 conditions, however, this doesn’t take into account adaptations and shifts in competitive pressure, nor the natural spatial and temporal variation of pH and dissolved CO2 in their native habitats. The measurement of OA is historically complex and the correct determination of at least two parameters is necessary to obtain a valid description of the whole carbonate system and hence correctly interpret organism responses (9). Although dissolved CO2 is relative to the pH and partial pressure of CO2 (pCO2), due to previous difficulties with pCO2 resolution and disputes in pH measurement protocols, total alkalinity (AT) and dissolved inorganic carbon (CT) were the favoured parameters for ocean carbonate calculations (9). However, now that technology has developed allowing for more robust measurements of small-scale pCO2 and stable pH readings, there is debate on what parameters offer the least uncertainty. This has resulted in difficulties with comparability of data, and an assortment of the four parameters being measured in various experiments (9). Therefore, not only an appreciation of ecological variables is required but also standardisations in methods for measuring OA across the scientific community. Acidification of freshwater was a problem that was first identified in Scandinavia during the early 1970s. Freshwater ecosystems typically have a neutral pH, but inconsistencies can occur between acidic or alkaline (10), depending on factors such as rainfall and buffering capacity. The acidity of freshwater lakes and streams is predominantly determined by the soil and rock types of an area, since 90% of the water entering these systems has passed through the ground (11). Biota within these systems can be influenced directly by changes in water quality during both short acidic episodes and longer-term sustained periods of acidification as well as indirectly, by alterations to the balance of acid-sensitive and acid-tolerant organisms at different trophic levels (12). Although species living in environments that naturally experience significant variation in pH and/or pCO2 may be more tolerant of anthropogenic acidification (10), the combined effects of both the chemical and biological alterations can adversely impact biogeochemical processes (12). Therefore, it’s important to recognise the mechanisms which can cause both natural and anthropogenic fluctuations, and how the local topography influences the deviations. Similarly to freshwater, local topography and biological activities can cause pCO2 and pH fluctuations in marine environments. A change in the balance between the respiratory CO2 production and photosynthetic CO2 consumption of marine reef organisms, can cause substantial pH gradients on a diel cycle, which may be more prominent in shallow water reefs where there is restricted exchange with the open ocean (10). As these temporary variations seem to occur regularly, it might not simply be the range over which pH varies that is important for tolerance to acidification, but also the duration. Shallow submarine CO2 seeps are among the few sites in the world within which the ecological consequences of long-term (multi-decadal) exposure to high CO2 can be assessed in situ (7). Habitats such as those found around Castello Aragonese (a small volcanic island located in Ischia), can provide a real-time model for the future acidity levels forecasted by 2100, and consequently these acidic conditions are fatal to otherwise native species, home only to jellyfish, seagrass and algae (13). Another unforeseen outcome is the possible adverse impacts on marine mammals’ ability to communicate using low frequency noise (6). Seawater chemistry influences the absorption of sound and how sound travels underwater. With the drop in pH forecasted by the end of this century, seawaters ability to absorb sound could see it travel up to 70% farther, resulting in the potential interference of marine mammal communication by low frequency noise generated from anthropogenic causes (i.e. military sonar, shipping and seismic exploration). Research in parts of the north Atlantic has already found a decrease of 15% in low frequency sound absorption, and is thought by some to be a result of increase acidity (6). The stressors which could influence the outcome of ecosystem-level responses to ocean acidification are abundant and varied, depending on environmental characteristics. In addition, the data is influenced by the parameters measured, therefore, it is important to perhaps overcompensate in order to achieve a comprehensive data-set which may animate additional components previously overlooked. The technology used to acquire this information will need careful consideration. Multi-parameter integrated systems can be developed to specification, however, what is measured, where the systems will be deployed and how long for, all influence the type of technology used and in some cases, the design or calibration of the individual sensors. Long time-series data sets are vital to determine accurately what changes are taking place, especially to avoid seasonal variability which may distort data. Considerations of climate and location attributes are also essential. Areas of low dissolved O2 (DO), nutrient rich waters, high phytoplankton abundance or tropical climates, are likely to experience elevated levels of biofouling, resulting in regular maintenance requirements or disruptions of the sensors ability to record accurate results (i.e., recording of CO2 may be from the biofouling organisms, and not a true representation of the environment and disturbed time-series). Similarly, the power supply endurance of modern instruments following extended deployments, can be disregarded if the sensor itself gets fouled within a short period. The ability to visit and recover the sensor if it is deployed without real-time telemetry will also reflect on the length of time it will need to be underwater (i.e. Polar Regions are seasonally dependent). Even the best technology currently available will have its limitations, whether it is resolution, long term stability and endurance or deployment depth restrictions. For example, although there are many pH monitoring solutions on the market, not all are suitable for ocean chemistry research, not just in regards to accuracy and stability, but in terms of maintenance requirements and depth limitations which reduce suitability for platforms such as AUVs, floats and gliders. Whilst technology is developing to meet these needs and overcome the current limitations, it is vital that the best available instruments should be utilized to ensure that the data acquired by them are meaningful now and in the future. Phytoplankton abundance combined with high resolution pCO2 sensors, may help in providing long term data into natural variations in different environments. Satlantic’s new series of Photosynthetically Active Radiation (PAR) sensors provide highly accurate measurements of PAR (400 – 700 nm) for a wide range of aquatic applications. PAR sensors provide superior data along with high quality construction to stand up even in the harshest conditions and application include oceanographic and freshwater productivity studies, vertical profiling, as well as laboratory photosynthetic physiology studies. Additionally, monitoring pO2 in line with pCO2 can provide estimates in primary production and respiration of these organisms. Sea-Bird has developed an individually calibrated, high-accuracy, optical oxygen sensor to assist in critical hypoxia and ocean stoichiometric oxygen chemistry research. Used alongside Sea-Bird CTD systems, the SBE 63 optical dissolved oxygen sensor sets the oxygen measurement standard for oceanographic research. The HydroC CO2 sensor is a unique underwater carbon dioxide sensor for in-situ and online measurements of dissolved CO2. The HydroC CO2 is perfect for profiling, AUVs and rosettes or for long-term deployment on buoys, moorings or even biogeochemical profiling floats, like the Sea-Bird Navis float, and its high-precision optical analysing NDIR system makes it ideal for air-sea gas exchange, ocean acidification, climate studies and carbon capture and storage (CCS-MMV) research. It is likely that in order to achieve certainty in data, over-compensation by measuring multiple parameters at once will not only provide insight into influencing factors at that location, but also strengthens the overall robustness of the result. There is still plenty of scope for investigating OA and the need to deliver precise data for global ocean-atmospheric models, which allow attribution of changes to both anthropogenic and natural causes. Technology is advancing to help deliver relatively simple sampling methods for CT, AT, pH and pCO2, as well as a growing understanding of the interdependencies affecting the overall bionetworks responses, on both chemical and biological levels (6). (2) Barry, J.P. (2010) Marine organisms and ecosystems in a high-co2 ocean and an overview of recommendations from the national research council’s committee report on development of an integrated science strategy for ocean acidification monitoring, research, and impacts assessment. Statement for consideration by Subcommittee on Oceans, Atmosphere, Fisheries, and Coast Guard of the Committee on Commerce, Science, and Transportation United States Senate. (4) Feely, R. A., Doney, S. C., Cooley, S. R. (2009). 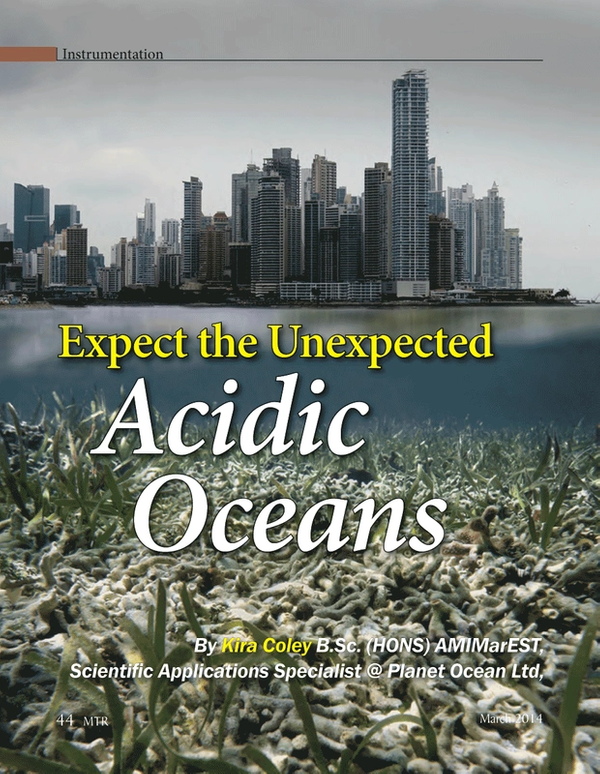 Ocean acidification: present conditions and future changes in a high- CO2 world. Oceanography 22:36–47. (12) Muniz, I.P. (1990). Freshwater acidification: its effects on species and communities of freshwater microbes, plants and animals. Proceedings of the Royal Society of Edinburgh. Section B. Biological Sciences, 97, pp 227-254. doi:10.1017/S0269727000005364.